IOWA STATE UNIVERSITY. COLLEGE OF DESIGN. Our inquiry as response, began with the German philosopher Gernot Böhme, and his philosophy of architectural atmosphere. This is architecture experienced through all the senses, in a correspondence of body and environment. He argues that this is the most appropriate aesthetic philosophy for architecture. 2 This perspective was not however, without criticism and our explorations also included readings from Luce Irigaray, Arnold Berleant, Jane Bennett, and Yrjö Sepänmaa. Weather Permitting. Collage by Peter P. Goché and Fırat Erdim. The materiality of an environment can be understood in a variety of forms that range from auditory systems to tactile systems to olfactory systems. For instance, the recognition of the material presence of sound as a form tends to be comprehended when in relation to the equally material presence of silence. Materiality is affect. We need only look at the discipline of anthropology to discern the magnitude of such an attenuated range of medium to appreciate the full weight of material cultures and the vast corpus of different material realms which we routinely inhabit. 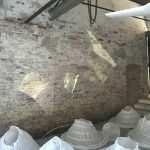 That individual experiences vary with respect to their context is well known among those engaged with the conception and enactment of works based in human occupation. This variation is a cognitive response to the constituent environmental factors of which air is primary. 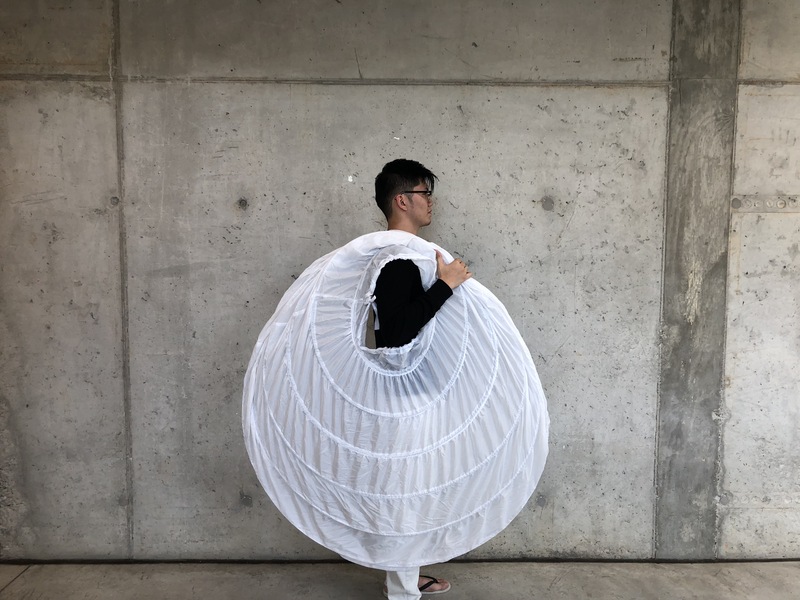 Our take on the curatorial call for Freespace thus positions the body as instrument in an eco-aesthetic, perpetuated by the dynamic life current of material in air flow. 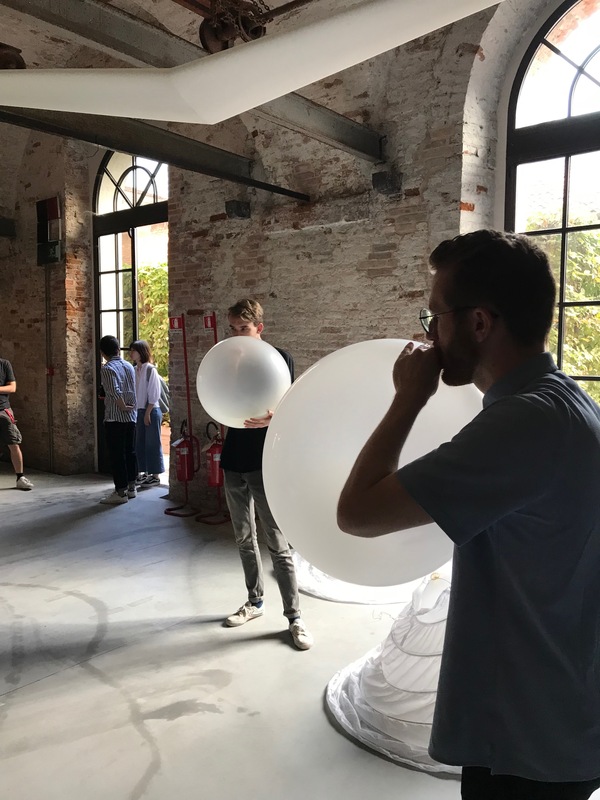 The ISU CoD DoA Biennale Session consisted of a two-day student workshop and a subsequent colloquium on the twin themes of architectural atmosphere and eco-aesthetics. 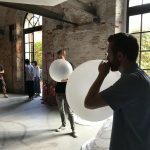 The workshop product was formed from the dialogue between two sets of apparatuses—a Kite Choir and Air Field—that translates the literal atmosphere of nature into an architectural atmosphere, to serve as a stage for the subsequent colloquium. The colloquium, hosted by the DoA Chair, Deborah Hauptmann, with guest speakers Mark Dorrian, Tina Engels-Schwarzpaul, Benno Hinkes, Paula Matthusen and Andrej Radman, engaged students, faculty, and guests in dialogue about the philosophy of architectural atmosphere and its relation to natural and cultural environments. Weather Permitting: Kite Choir (Iowa Rehearsals) from Firat Erdim on Vimeo. 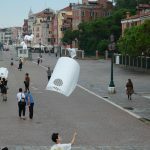 The Kite Choir component of Weather Permitting responded to the call for Freespace by inventing new aesthetic practices and apparatuses that redirect conventional means of subjectification otherwise, toward an attunement with the agency of the atmosphere. 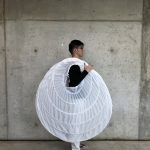 The Kite Choir is an ensemble with custom-made kites and aeolian sound instruments, that builds upon traditions of singing kites from China, Japan, Vietnam, and Bermuda. While the sound instruments in these traditions are carried aloft by the kites they are attached to, the Kite Choir utilizes the tow-line and reel of the kite as the sites of instrumentation, to promote a collaborative chain of agency across atmosphere, kite, and performer. The sound instruments developed included both acoustic and electronic components: ribbon tow-lines attached to contact mics and portable mini-amps; tin can resonator reels; “hurdy-gurdy” reels of various sizes and materials; mp3 players attached to short-range FM transmitters in relation to ground-based radios. 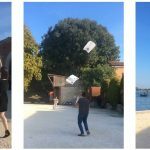 The iterative process of experimentation to develop these kites and the sound instruments was in itself a heuristic aesthetic practice of attunement with the vitality of matter. While still in Iowa, ISU students and faculty rehearsed as the Kite Choir, accustoming ourselves to these instruments of flight and sound, to the need to align our schedules to the weather, to pay attention to the wind direction and its interaction with the earth-bound features of a place. The score for the Kite Choir, composed by Paula Matthusen, Associate Professor of Music at Wesleyan University, provided a variable a set of instructions contingent upon aeolian, climatic, temporal, and psychological conditions. This score was printed as decks of “playing cards” provided to the members of the choir. 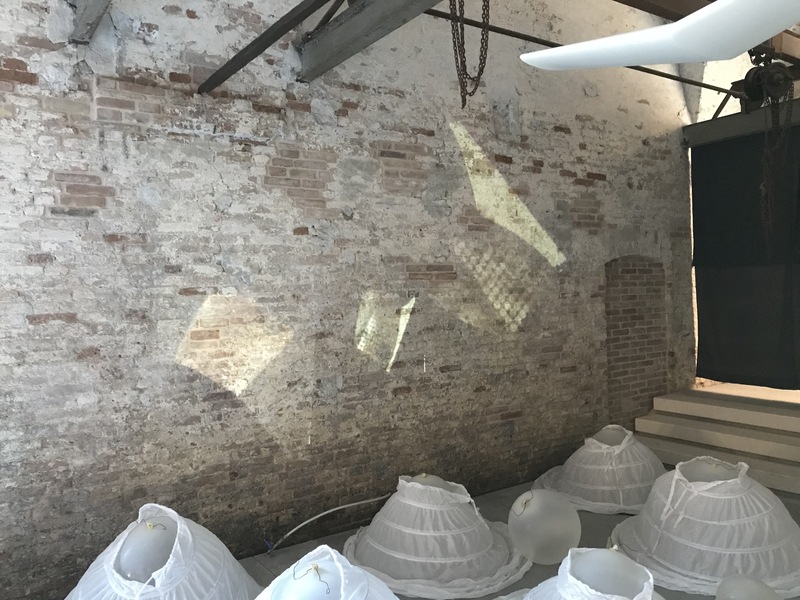 In Venice, the recordings from Iowa were housed in the Airfield, a pneumatic installation at the Arsenale dependent on the breath of the session participants. Over the course of the week, the Kite Choir roamed the atmospheric geography of the city in pursuit of the wind, and performed the meditations of Matthusen’s score on the streets, canals, and piazze of the city. 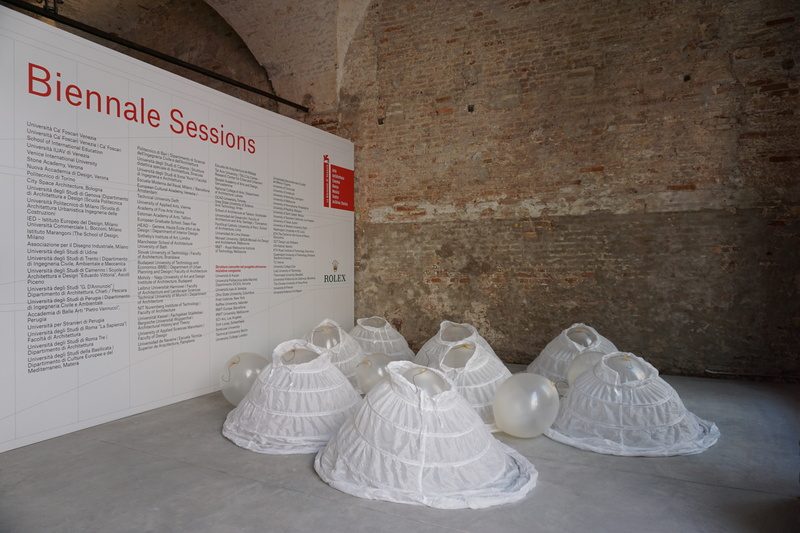 Time is, thus, made present through a calibrated fiddling with material and space in effort to bring about awareness of a potent inventory of human exhalations contained in a field of 36” diameter latex bladders beneath an array of hoop skirts located in the Sale d’ Armi G. This ground piece combines with the world while containing it. 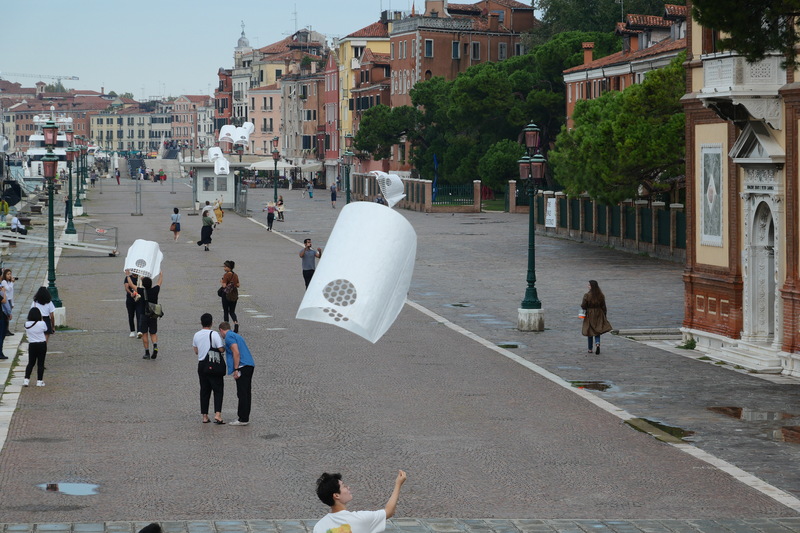 It is a system of things which have been calibrated to perform an act of stillness in the context of a dynamic choir of kites and the consequent sonic nature this air-born fleet in the context of Venice, Italy. Mark Dorrian began his talk at the colloquium with this email from the coordinator Andrea Wheeler ahead of the event. 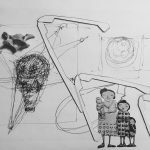 The colloquium sought to explore with others thinkers – artists, theorists and historians – atmosphere, and materiality. Presented papers addressed critical and cultural perspectives on the aesthetics of the shared medium of life and living: air. – Andrea Wheeler, Assistant Professor of Architecture, DoA, CoD, ISU. – Mark Dorrian, Forbes Chair of Architecture, The University of Edinburgh: On Air. – Tina Engels-Schwarzpaul, Professor of Spatial Design and Postgraduate Studies, Auckland University of Technology: Vā, hau, mauri, qi, atmosphere and entanglements: Alternative concepts of space, spirit and power. – Benno Hinkes: Architecture from the Perspective of an Ecological Aesthetics. – Paula Matthusen, Associate Professor of Music, Wesleyan University: Space/Score. – Andrej Radman, Delft University of Technology: INVOLUTION: A Mereotopological Perspective. 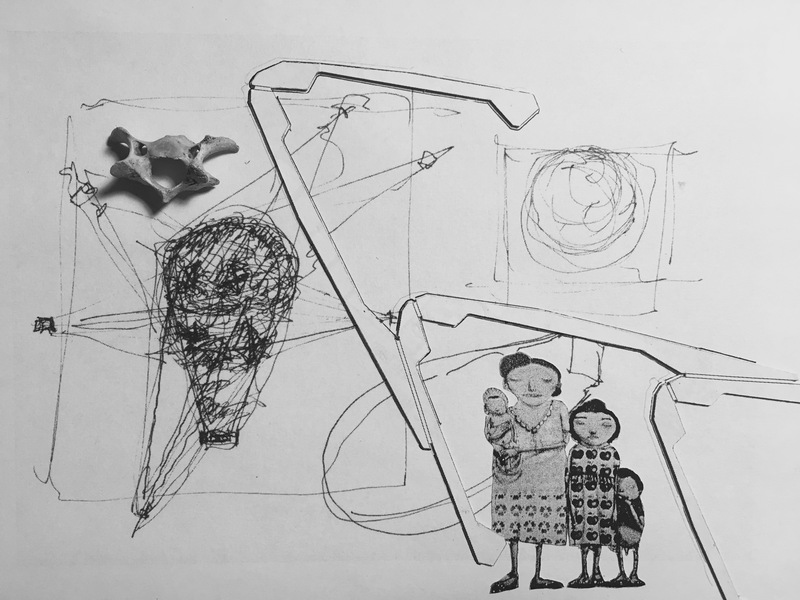 – Zihan Xiao, Graduate Student, Department of Architecture, Iowa State University: Space · Air · Breath · People · World. Fırat Erdim, Assistant Professor of Architecture, ISU. Peter P. Goché, Assistant Professor of Architecture, ISU. Paula Matthusen, Associate Professor of Music, Wesleyan University. Mikesch Muecke, Associate Professor of Architecture, ISU. Andrea Wheeler, Assistant Professor of Architecture, ISU. Kaitlin McCoy, Department of Architecture, ISU. Zihan Xiao, Department of Architecture, ISU. 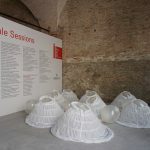 In Venice, the organizers and staff of the Biennale di Venezia and the Biennale Sessions, particularly Serena Cutrone. In Rome, ISU College of Design Rome Program Staff. In Ames, Deborah Hauptmann, the Chair of the Department of Architecture, and the staff of the College of Design and Department of Architecture. Böhme, Gernot. “Atmosphere as the fundamental concept of a new aesthetics.” Thesis eleven 36, no. 1 (1993): 113-126. Irigaray, Luce, and Michael Marder. “Without clean air, we have nothing.” The Guardian, May 17th, 2014; Irigaray, Luce. “Starting from Ourselves as Living Beings.” Journal of the British Society for Phenomenology 46, no. 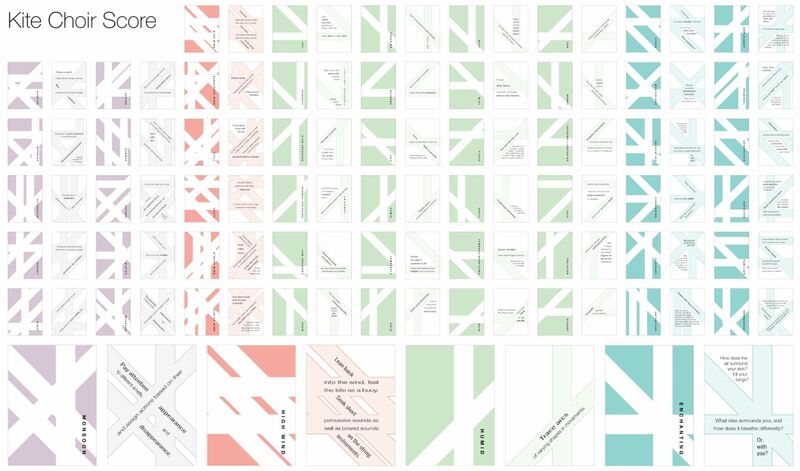 2 (2015): 101-108; Grammatikopoulos, Christina “Remembering the Air: Luce Irigaray’s Ontology of Breath” Interactive: a Platform for Contemporary Art and Thought. 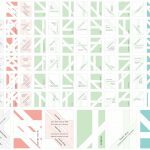 Available at: https://interartive.org/2014/05/irigaray-air; Irigaray, Luce, and Michael Marder. “Without clean air, we have nothing.” The Guardian, May 17th, 2014; Berleant, Arnold “The Re-shaping of Experience”. In Arnold Berleant Aesthetics Beyond the Arts. London, Routledge, 2012; and. Sepänmaa, Yrjö. “Multi-sensoriness and the city.” In Berleant, Arnold, and Allen Carlson, eds. The aesthetics of human environments. Broadview press, 2007, 92-99. Böhme, Gernot. “The concept of body as the nature we ourselves are.” journal of speculative philosophy24, no. 3 (2010): 224-238.